The 1964 presidential campaign reshaped the American political landscape. Lyndon B. Johnson’s “Great Society” and civil rights agendas pushed Southern states toward the Republican Party and brought the Northeast in line with the Democrats, creating America’s contemporary geopolitical map of red and blue states. Barry Goldwater’s rift with “the liberal Republican establishment,” or “Rockefeller Republicans,” served as the basis for his landslide defeat in the general election, but also for the rise of an outspoken and blossoming conservative movement. Barry Goldwater’s presidential campaign also spawned the political career of Ronald Reagan, and inspired future conservative offshoots like social and Christian conservatives as well as the Tea Party. 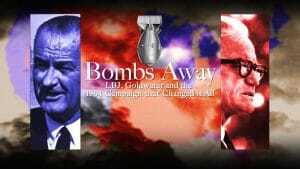 Bombs Away: LBJ, Goldwater & the 1964 Campaign That Changed It All includes interviews with historians and participants in the campaign. On CPTV: Monday, October 9 at 10 p.m.